6.50 points at 20 votes (rank 498). 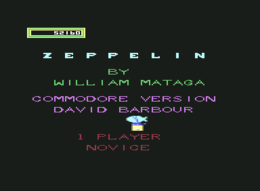 Zeppelin is an arcade game where you have to fly with an airship through a cave system. 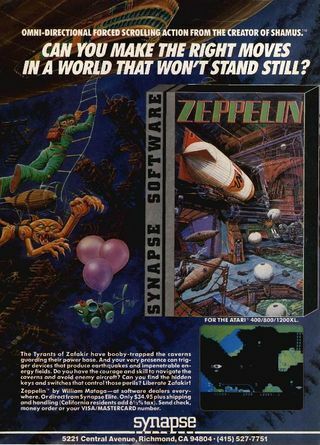 There you have to avoid hostile zeppelins or shoot them. Hamburger creatures block the way and touching the walls is deadly. Keys need to be picked up and keyholes need to be touched with them to open further caves. Defensive fortifications can be switched off by shooting at the switches. To make the game even more interesting, earthquakes are released randomly. This makes it a bit more difficult not to collide with the walls. 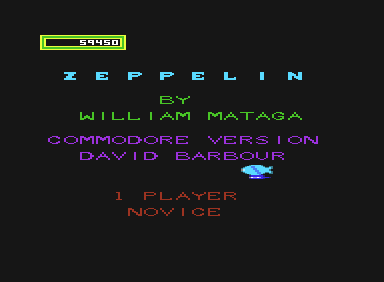 For a game from 1984 it looks quite successful and corresponds to those of its time. To pause the game, you have to press the key Space . The next time the joystick is moved, you can go on playing. Switch If you shoot at a switch to change their position, some defenses of the enemy will be deactivated (zeppelins, balloons, earthquakes etc.). Every switch has a different function in the labyrinth. Key You pick up keys, when you touch them with the zeppelin. Keyholes If you touch a keyhole and have a key, more caves will open. Hamburgers You can pick up giant hamburgers to feed the hamburger creature. Hamburger creature The hamburger creatures guards some places in the labyrinth. They can be bribed with giant hamburgers, whereafter they leave their place. To feed a hamburger creature with a hamburger, you need to touch it with the giant hamburger. The hamburger creature will then scoff the hamburger and maybe leave its place. Life symbol They give the player a new life when you touch it. TNT The TNT needs to be picked up by touching it with the zeppelin. It needs to be brought to the room, where the piston is. Piston First you have to shoot at the piston to get it into the right position. Then you have to put the TNT into the box. Now you can destroy the piston by shooting at the TNT. Through this, the piston will slide downwards and free the way to the next level. In the two player mode, two players play at the same time with two joysticks. 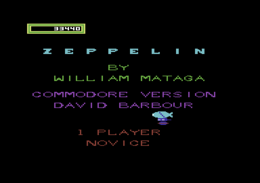 One player steers the zeppelin, while the second player acts as shooter. The version that is offered for download at Gamebase64 was cracked by Wanderer & Crypt and expanded by two trainer functions. The start the game as usual with RUN. 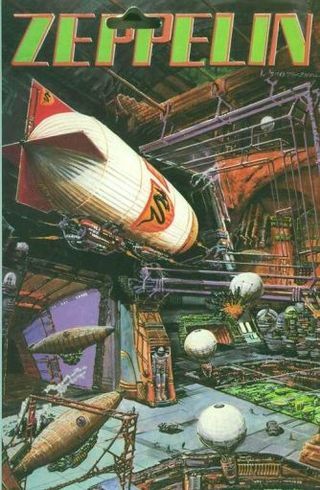 Robotron2084: "In this game the player is heavily limited in his mobility and has to fly several tours through every cave system to pick up hamburgers as well as TNT, which is rather repetitive. Also it is not always clear what function is done by which of the switches in the walls. One feels domineered and thus frustration quickly arises. A rather monotonous shooter in the long run. 6 out of 10 points." Shakermaker303: "It was quite interesting to wobble with the airship through the cave system, even though I didn't have a clue, where I should get to." This page was last modified on 7 February 2016, at 18:30.